A big part of this equation depends on the designated purpose of the aircraft. If the aircraft is your personal aircraft for recreation and light business travel (think Cessna, Piper, or Beechcraft singles and twins), then the answer will probably lean towards renting. Most public airports build T-hangars in bulk, which allows them to keep rental costs relatively low. For the aircraft owner who flies occasionally and generally for pleasure the investment of time and cost into building their own hangar probably will not add up, and it will likely be difficult to purchase an individual T-hangar from the owner. Also, should you decide to move to another airport for whatever reason, you will then be ultimately responsible for the sale of said hangar. Hangaring corporate aircraft is another matter entirely. First and foremost, corporate aircraft are far too expensive to ever consider leaving exposed to the elements. It is one thing to leave a tired old Cessna 150 unsheltered; it is a very different matter when corporate aircraft on the low end of the spectrum will be well over half a million dollars (a rather conservative estimate). Corporate aircraft must be ready to operate at all times, and generally operate at a much higher operational tempo than pleasure aircraft. The expectation is that corporate aircraft are a tool and will provide a definite return on investment. The expectation is that prime user will be able to get on his airplane short notice and be taken wherever they must go. Corporate hangars generally serve as the maintenance hub as well, so ample space must be provided for the aircraft as well as necessary ground support equipment. To reduce hangar costs, some corporate aircraft owners rent hangar space, as it still is a simpler option and may still prove economically advantageous for a single aircraft. However, it is not uncommon for large corporations to operate a small fleet of corporate jets out of a single location. This will necessitate their own real property acquisition for hangar space and associated support. The question posed is the cost of a hangar. There is no single answer because of the huge amount of variables involved. Population density, local regulations and code, tax rates, and aircraft type are all factors in the equation. Rental costs may vary wildly even between airports only separated by a few miles. Recall that in business, time is absolutely money and an executive will trade thousands more per month to get to his aircraft in 20 minutes rather than spend 60 to 90 minutes commuting out of the metro to a cheaper airport. For those thinking that building might be a better option, they must consider the reality of what “owning” a custom-built hangar on an airport actually means: you may own the building, but you are leasing the land. Since you cannot move the hangar in the event that something falls through on the lease, it generally defaults to the owner leasing the land (the airport). Effectively, the only thing owned is just a building. However, this is not to say that there are no advantages. Hangar owners will not have to compete with other renters for prime parking in the hangar, so they have the ability to park as they wish and egress the hangar with much greater brevity. When renting, their aircraft is likely to be pushed wherever it fits the best, which adds a lot of time in ground movement. Owning and operating an efficient tug certainly helps in this regard, but it does not change the fact that time will be sunk shuffling aircraft around in order to move the aircraft. It is very important to understand that, when renting space, the renter is subservient to the price established by the owner. 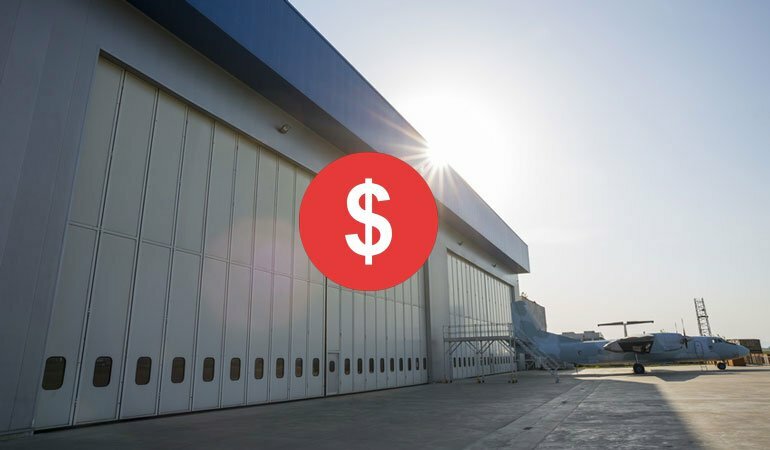 It is not uncommon for the monthly airplane hangar cost to be considerably higher for a jet than a comparably sized turboprop in the same facility. The rationale is that fairly simple: the liability is much higher to hangar the more expensive jet than the turboprop. Repairs from all-too-common hangar rash will simply cost more on the jet, which goes directly against the bottom line of the owner. The best estimate of building cost of a steel aircraft hangar is around $22 per square foot (ca. $236,80 per square meter), although this is not an accurate portrayal of the overall cost of the lease. Since the land is all-but-assured to be used as a lease rather than purchased, the cost of the lease must be figured into the long term figures for the purchase. Leases are often written in terms of 25 years, so careful consideration must be given to future use requirements. Of course, privately owned hangars on leased land can certainly be sold like any other real estate (e.g., selling an individually own apartment in a larger complex), so this should be taken into consideration as well. Choosing an airport with cheaper property for lease must be weighed against how well hangars have been bought and sold historically. The cost of buildership is not the final cost, but more of a primer. Should you choose to build a hangar, certain costs which would be defined in a rental agreement will be null. If own the hangar, you will be fully liable for all utilities, owner insurance, and all building maintenance and repairs. Since a rental is built around all members paying a sort of pro rata enveloping many of these costs, the amount per renter can be reduced. Costs of building maintenance should be divided between renters as well, rather than one person or entity absorbing all of the cost. Hull insurance on the aircraft will not change much but insurance premiums as the owner vice renter would almost certainly be higher. A significant advantage to consider in building a hangar is that you get to build it to the exact specifications which are perfectly tailored to your operation. If you have a fleet of identical aircraft, it can be built to optimize their utilization. If your fleet is mixed, it can be designed to move aircraft in and out depending on usage of each aircraft. A hangar can be built with dedicated maintenance space, and operation support space allocated to the specific function. When renting hangar space, the end user is truly subservient to the owner and his needs. The additional airplane hangar costs may be absolutely worthwhile to build the exact facility you need if you are losing money due to missed or limited utilization because the space available for rental was not conducive to your needs. Consider the services and support available at your target airport. Renting or building may be considerably less expensive at a more rural airport, but what do the actual services look like? What if the less expensive airport only has non-precision instrument approach procedures available? Depending on what part of the world you are based in, this could be a non-issue or an absolute deal breaker. An airport with cheap rent or land lease but limited after-hours support and mediocre instrument minimums may turn out to be a net loss if the aircraft cannot be utilized for significant portions of the year. That could also end up making real estate difficult to sell because potential buyers are going to be looking at the same comparables when they are looking for space. Deciding on a base of operation for corporate aircraft is a big decision; it is the driving force in how effectively owners may utilize their aircraft. Corporate aircraft only offer return on investment when they are moving executives, so in the best interest of making a profit, the aircraft must be available. Reduced down-time, turnaround time, and simplified ground movement operations are the key components in this metric. Comparing costs between renting, purchasing, or building an airplane hangar are important but even these costs pale in comparison to the cost of an executive aircraft. As the old adage loosely suggests, “if you cannot afford the hangar, you probably cannot afford the aircraft”. The same logic applies to the necessary ground support equipment, support personnel and staff, maintenance, and operational costs. Jets are very expensive commodities, and companies which purchase them do so for a distinct purpose: the value of private aircraft ownership is reflective of the value of their passengers. If it were not, then the executives would travel in some other way. You want to reduce your costs and increase your ROI? Get our free eBook on ground handling now and learn how you can improve your ground handling performance!